I was asked to do quite a general Bristol type beastie, so fitted a few landmarks on it - Clifton Suspension Bridge, Wills Building, Cabot Tower, Tobacco Factory, SS Great Britain, coloured houses and Westmoreland House with BC graff on it. Turned out OK despite the heavy showers and having to dive under the shelter of a tree now and then. I put balloons in the piece also, even though I'm not that keen on them murals. 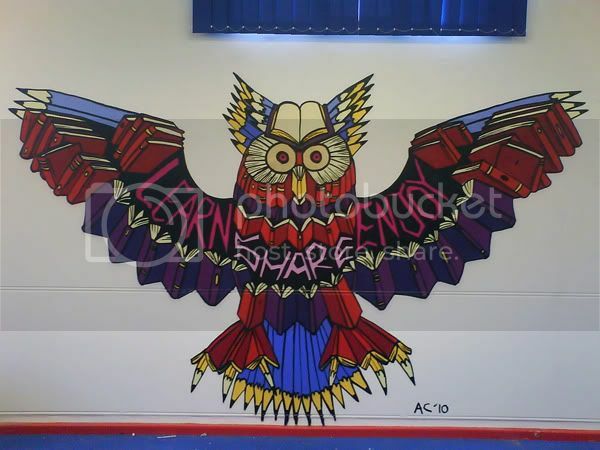 Ah well, tis a school mural. 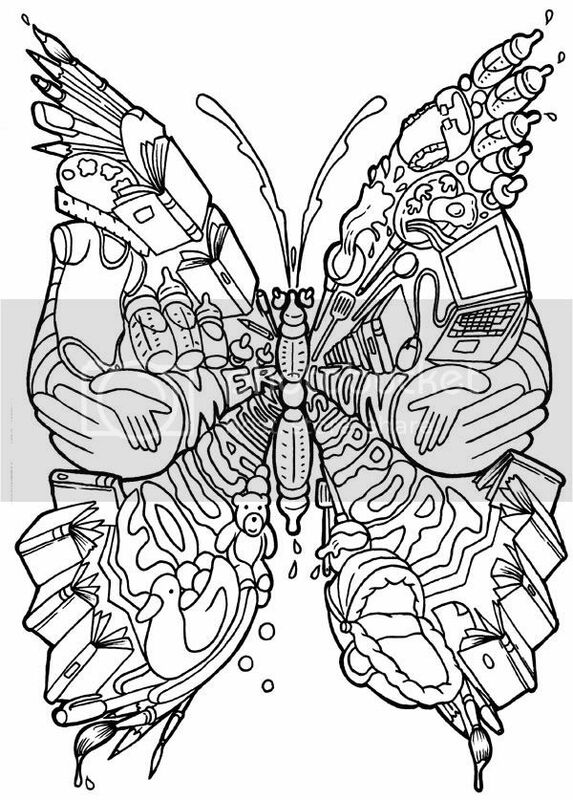 Here's the original design I did for the piece. 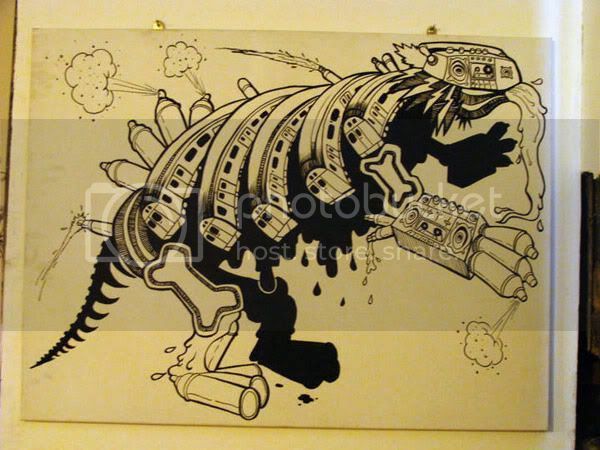 I altered the final wall painting to have a different angle on the neck so that the creature could fill the wall better. Dinosaur I loosely based the creature on is Pachycephalosaurus. Library book owl! The owl is made of. as you might have guessed, books, but also pencils and the words 'Learn, Share, Enjoy' which I think is the school moto. I went in yesterday and sprayed him up on the wall. I ran out of time to do the falling books and leaves but reckon he's a good un still. 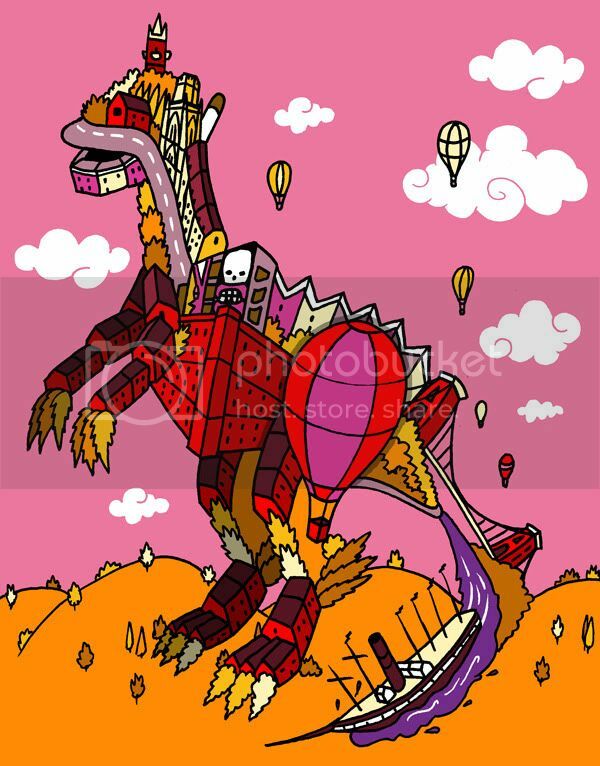 I be doing a signing of his new illustration 'Planet Bristol' at Niche Frames in Bristol on Saturday afternoon. 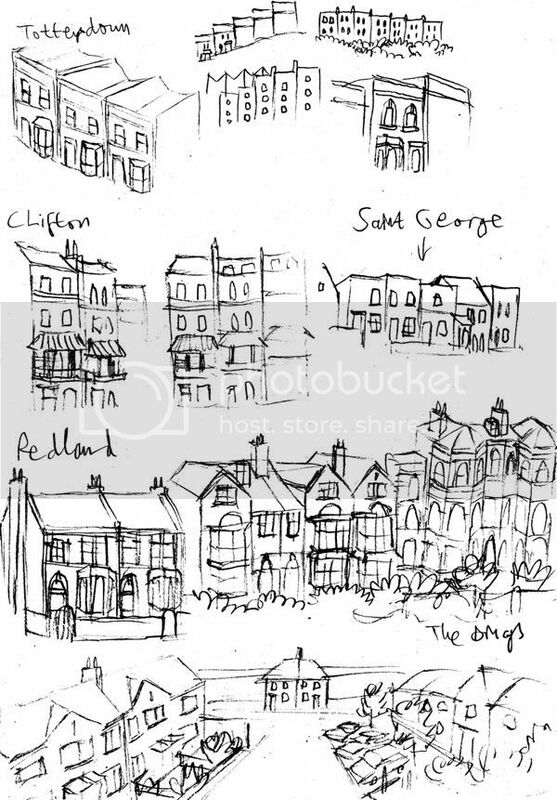 The print is an edition of 100 and features lots of Bristol type buildings and landmarks. Who knows, maybe your house is on it? Planet Bristol is for the Bristol Green Doors event which is about domestic green refurbishment throughout all areas of the city. All profits from the print sales go to the project. There is a facebook event page here. 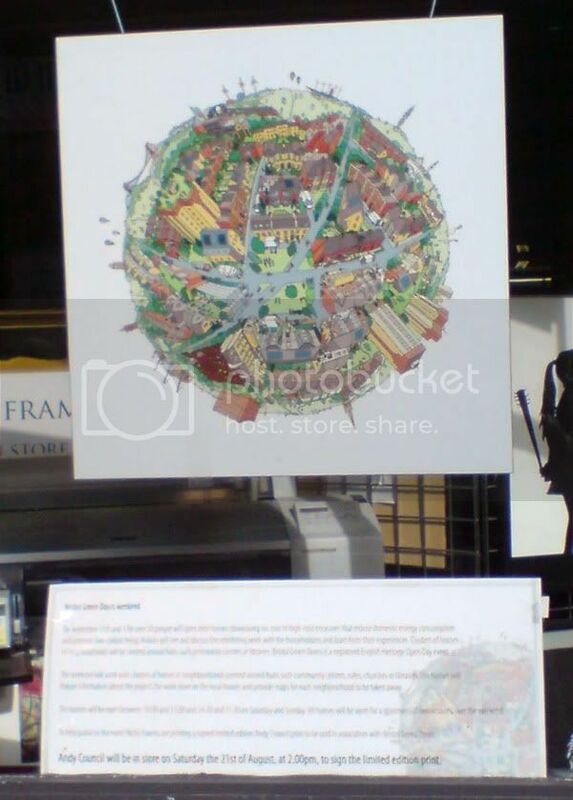 Below is a pic of the extra gert large version of the print that is in the window of Niche Frames at the moment and the notice about my in store signing. My partner Liz's production company Drastic Productions is working on an exciting new project - Dare Devil Divas! Here's a bit of info on the project - more is on the Drastic Productions blog (link above). 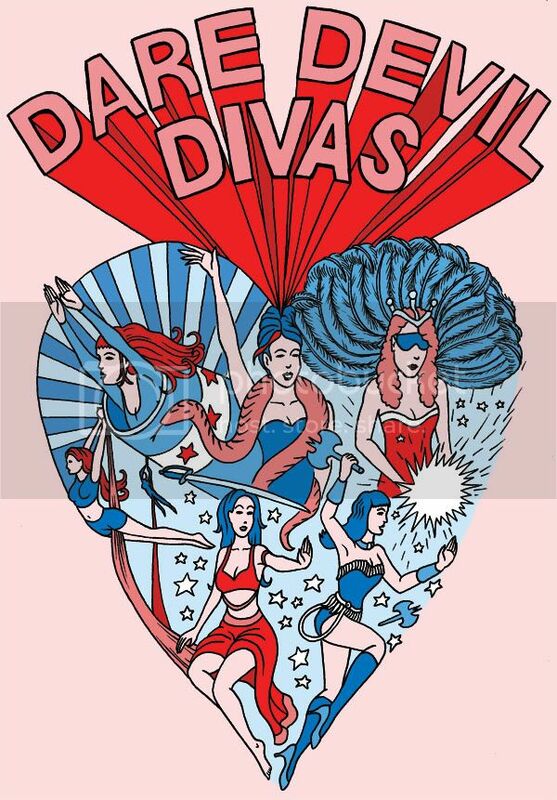 Dare Devil Divas is Drastic Production’s fabulously frivolous explosive new project! We are producing a fantastic show in Novemeber featuring dazzling daredevil feats of female prowess. We will be working with a group of women participants (up to 15) over 6 weeks who will learn about vaudeville, cabaret, physical theatre, burlesque & aerial performance. We have invited a team of top professionals to run specific masterclasses and to perform at the event. Liz asked me to produce a poster/flyer design for the show that had a kind of Stunt or movie poster feel to it and features some of the performers and what they will be doing in the show. Here it is! Drastic Productions is also on Twitter, here! A couple of weeks back I went along to do a spot of live drawing at the Weapon Of Choice show in the Howies store in Bristol. 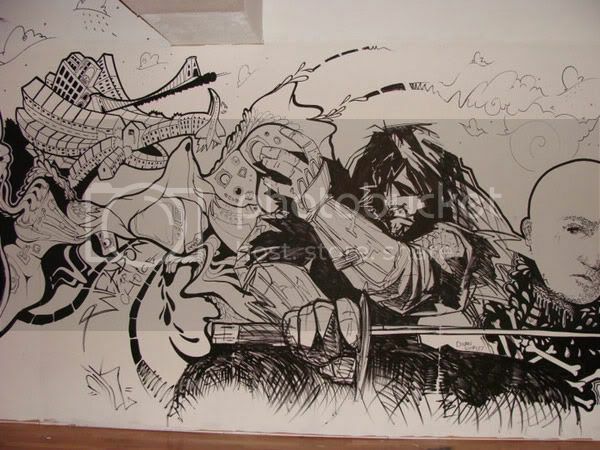 It's a nice big exhibition space there and loads of the old live drawings from the previous WOC club nights were up there. They all looked really good up together, the black and white colour scheme of them making a really cohesive show. I finally managed to finish off the canvas I started painting at the WOC gig featuring the Furious Five a while back. I'm glad I did as I don't like leaving things unfinished and it turned out alright. 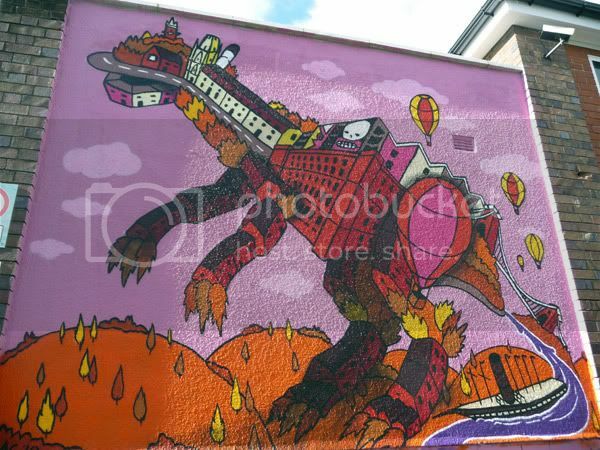 I then had some time left and there was a space to fill on the main wall, so came up with a kind of Bristol Triceratops head on the spot. See if you can spot it! 'Big Ups' to all who painted that night and the WOC boys. Cheers to Sylvia Meller for the pics. This week I have been working with a group of young women at the Meriton in Bristol to produce a mural to go outside the centre. 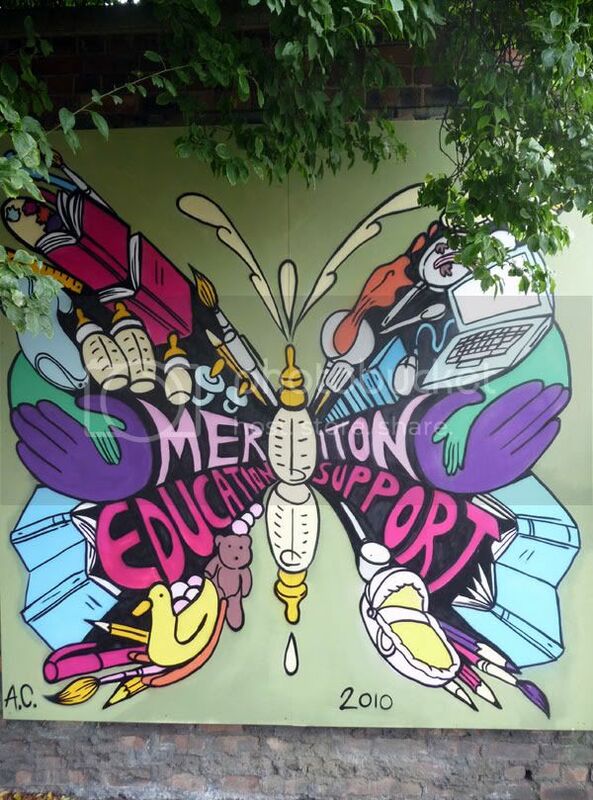 The Meriton is a specialist school based in Bristol focused on providing education, support, mentoring and advice to teenage girls and young parents. Working with pregnant girls and young mothers both pre and post 16 in the Bristol, Bath and the South West region the Meriton's aim is to protect the welfare of all children, including unborn children and vulnerable young adults. I went in and worked with the group to come up with one of my 'Lots Of Stuff' designs to represent the school. We took photos, brainstormed, made lists and drew sketches. I then went away and looked through all the ideas and information and came up with this Butterfly design. I returned with a bag full of spraypaint and had the group help me paint the piece. Everyone worked hard and here's the final painted piece which we are very happy with! It's a shame the trees in the way, can't see the top bits. If I had time I would go back with a saw and get a better pic. 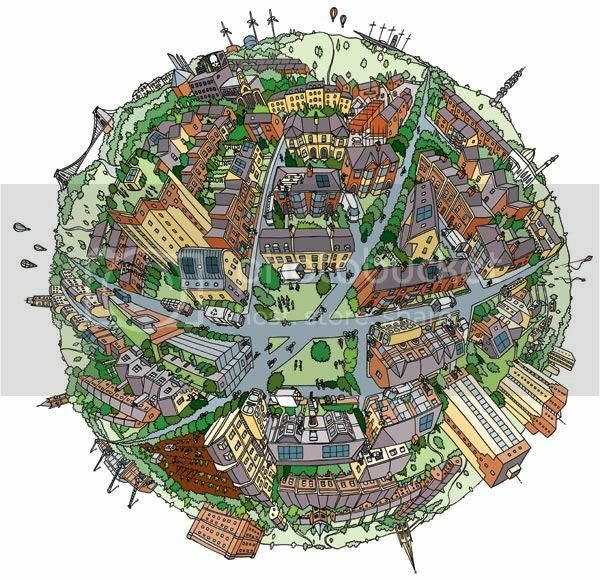 This is Planet Bristol, my illustration for the Bristol Green Doors event. It's a kind of a more complicated version of the Green Globe illustration I did last year. 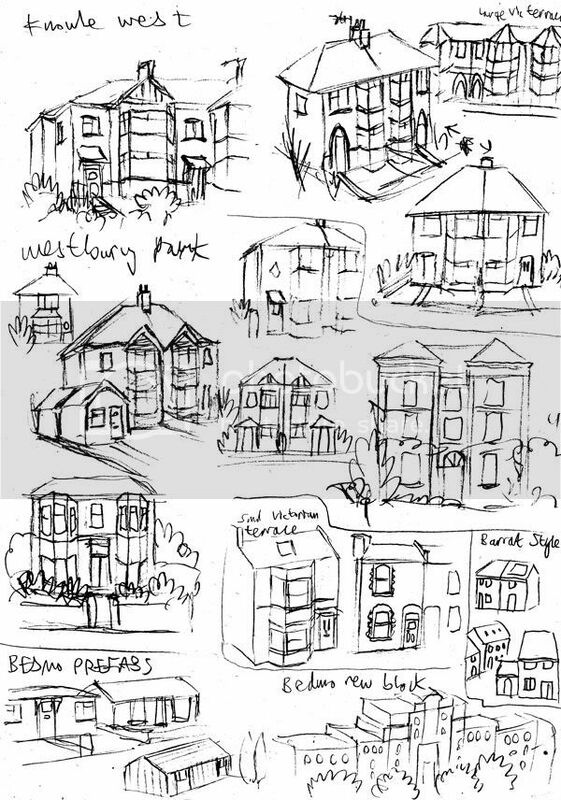 The event is about domestic green refurbishment throughout all areas of the city, so the illustration features lots of Bristol type houses and landmarks, installation of solar panels, insulation etc and people getting together and communicating. More information on Bristol Green Doors here. The piece was as you can imagine very complicated to do and a bit of a headache. Needless to say there was lots of swearing in its creation. 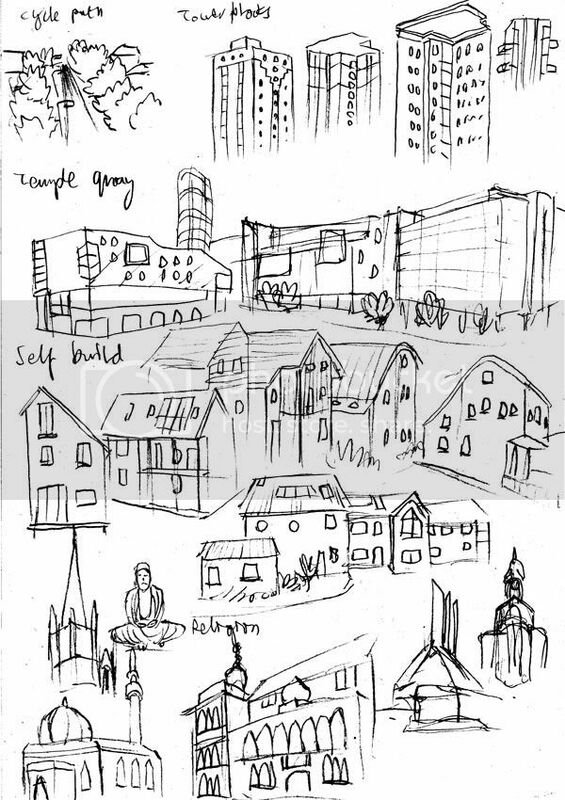 I started off by sketching out the various different types of housing around Bristol based around reference pics that Stu from the project sent me. 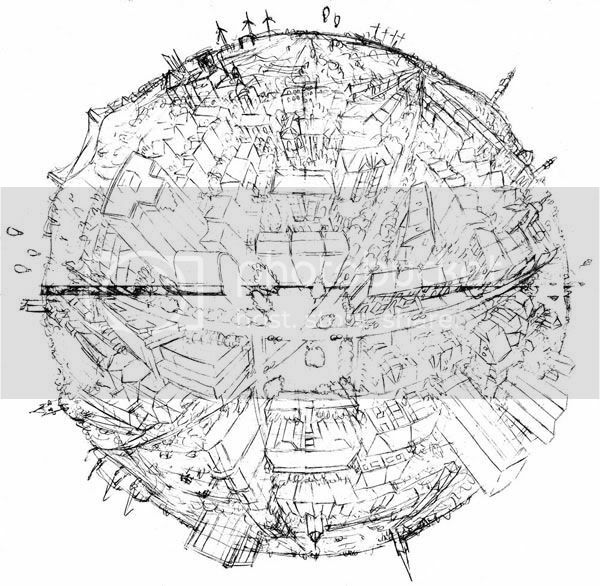 Then it was a case of placing all these buildings into a globe along with parks and landmarks roughly positioned to be in where they would be in North, East, South and West Bristol. I did this by tracing off a globe shape with perspective lines A2 size on my lightbox. I then worked over the top of this putting in key points and roads. This took several attempts and quite a bit of guess work. 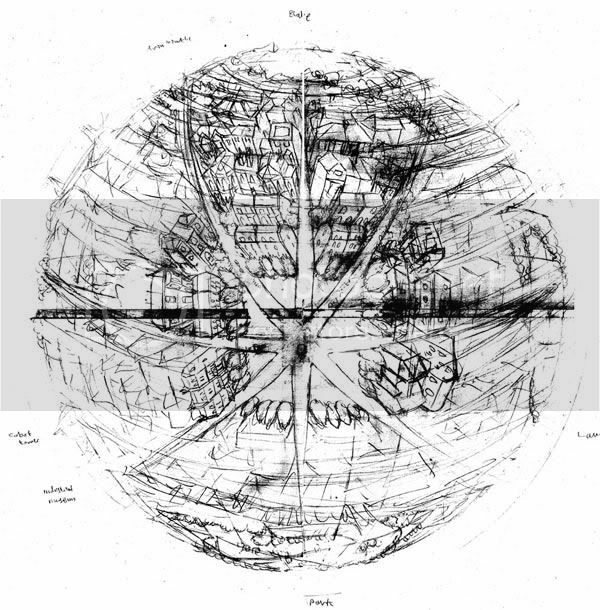 this first rough looked more like the Death Star. 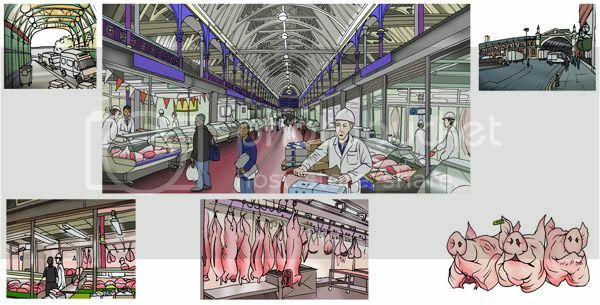 I had to scrap bits and start again, eventually came up with this rough which I then went on to add more detail with in pen and colour up using the limited colour scheme that I was given to work with. All in all, its a bit of a beast! 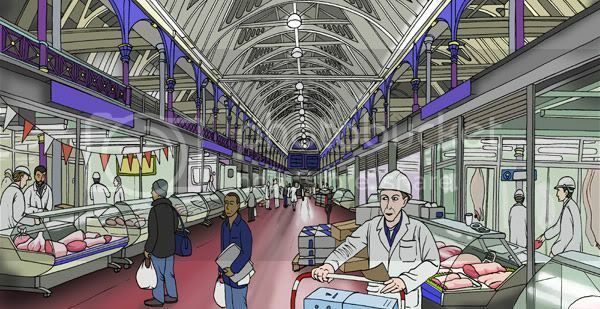 There should be Ltd edition prints available to buy of it soon. A bigger version of it where the details of it can be seen better is on my Flickr.